Is it a Famiclone? Is it a peripheral? Well, it’s actually both! These days, it seems, at least a few times a year we read news of an upcoming video game console packing the necessary hardware, or software, to run multiple systems from a single unit. 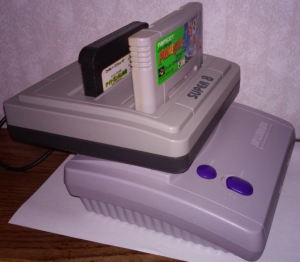 With the likes of the Retron5, among many others, gamers can now spend more time and money on video games themselves, rather than putting money into individual consoles. Though it may be a more current trend, this isn’t the first time such an idea has been marketed. I introduce to you the Super 8 by Innovation. Innovation is, perhaps, most well known for their third party video game accessories. With products such as controllers, AV cables and many others, Innovations broke into the video game market. Where does a video game accessory company go when they are tired of only making video game accessories? To the console market, of course! Not you Mad Catz. NO! Bad Mad Catz! Bad! With the Super 8 peripheral you can run three different consoles from the safety of your Super Nintendo, or Super Famicom. (Yes this works on the SNES-101 as well!) The Super 8 allows you to play Famicom and NES games from your SNES, which is quite odd but works very well. The Famicom and NES portions are handled by a system on a chip, but I haven’t found any incompatibility issued yet. Yes, it even plays Castlevania 3 without problems, and no I’m not kidding. 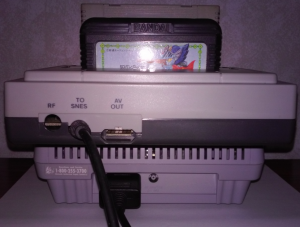 Are you someone who wants to play imported SNES/Super Famicom games without breaking the tabs in the cartridge slot? The Super 8 will facilitate that for you as well. I can’t fully test whether or not it will play PAL games for the Super Nintendo or PAL NES games, but I do know it plays Japanese NTSC games without a problem, at least the ones I have tested. I’m not completely sure, but I run on the assumption that Super Nintendo/Super Famicom games are run as pass-thru and working on the actual SNES hardware. Bone stock Super 8 units will have a rectifiable compatibility issue that I will explain later. 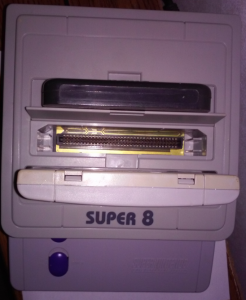 Simply place the Super 8 into your Super Nintendo like any other video game. Then you take the video pigtail, which looks like the normal Nintendo AV cables, and plug that into the back of your Super Nintendo console, and plug the actual AV cables into the output of the Super 8 peripheral. Be careful as the output on the Super 8 won’t fit perfectly snug, but as long as you make a good connection and don’t jostle the console or the peripheral you should be fine. Now it’s up to you to decide which one of the systems you want to utilize. I would heavily advise against filling both the NES and Famicom slots at the same time, but putting a Super Nintendo cartridge in with either Famicom or NES catridges won’t have any affect on the Super 8. Once you’ve booted up your Super Nintendo you should be greeted by a screen showing two controllers, a Famicom for 8-bit and a Super Famicom controller for 16-bit. The on-screen instructions will guide you through the process. That’s pretty much it. Now you should be playing one of the three systems the Super 8 allows. Now here are a few things you may need to know about the Super 8, whether you already own one or are thinking about purchasing one. 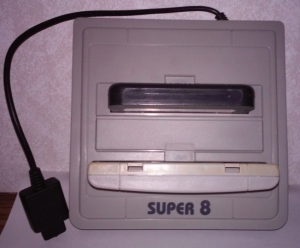 The Super 8 was designed to sit atop the Super Famicom design, not the squared off Super Nintendo or even the redesigned Super Famicom/SNES-101. You may find yourself having to shim the Super 8 to keep it straight on the console. If for any reason you are going to open your Super 8 it is highly advised not to do so in direct sunlight or under UV light as there is an exposed chip on top of the board. I carefully opened mine and covered that chip, so hopefully that’s taken care of that. Which leads us to why you may need to open your Super 8. One thing you may notice is just how temperamental your Super 8 is. Sometimes it may work, other times it may not work at all. Mine slowly degraded into not working at all. Being familiar with Famiclones I just assumed it was rendered nothing more than a unique conversation piece. After a year or so of it not working I opened the unit and noticed some of the chips are in sockets. Ever so carefully I pressed down on each chip to see if it was well seated, which all of them seemed as if they were. However, when I checked the unit after doing so it fired right up without any glitches. Finally the compatibility issue I spoke about earlier. The Super 8 will not natively play the Super Gameboy, and as an extension I assume it won’t play Super FX equipped games either. Someone at Innovation thought it would be a good idea to purposely cut one of the traces that is needed to play the Super Gameboy, but with a little soldering you can scrape yourself a few spots and bridge that gap. I’ve already done this on my Super 8 and can confirm it does restore the ability to use the Super Gameboy. I can not currently confirm whether it restores Super FX game compatibility though. The Super 8 is a fun little piece to own that opens your video game library up to a few different consoles you may not have been able to play before, as well as consolidates power and AV cables. Playing Famicom and NES games with an SNES controller does feel a bit weird, but if you’re familiar with Super Mario All-Stars you should be fine. If you’re interested in owning a Super 8 they might be a bit hard to find, but if you find one in good working condition I believe it’s well worth owning.